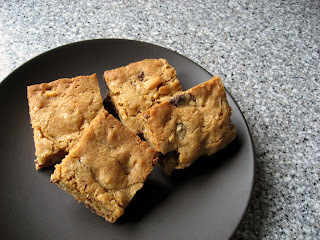 These blondies (the other brownie..) were really easy to make. 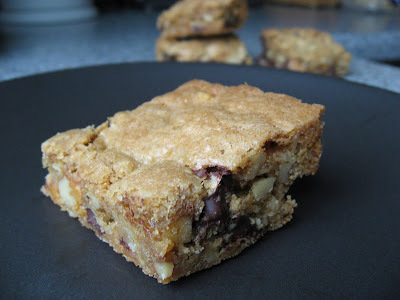 They have a rich buttery flavor, with loads additions (two types of chocolate, butterscotch chips, walnuts and coconut). A very easy and rewarding thing to bake! 2 sticks unsalted butter at room temp. 1. Preheat the oven to 325F. Butter a 13 x 9 inch baking pan and place it on a baking sheet. 2. In a medium bowl whisk together the flour, baking soda, baking powder and salt. 3. Using a stand mixer with a paddle mix the butter on medium speed until smooth and creamy. 4. Add the two sugars and beat for 3 min (or until well combined). 5. Add one egg at a time and beat for 1 min after the addition. 6. Beat in the vanilla extract. 7. Adjust the speed of the mixer to low and add the dry ingredients. Mix until just combined. 8. With a rubber spatula mix in the chocolate, butterscotch, walnuts and coconut. 9. Scrape into the baking pan, Spread out with the rubber spatula. 10. Bake for around 40 min (check after 30 min - you want a knife to come out clean when inserted in the center). 11. Put the baking pan on a wire rack, and let it cool for 15 min. Then turn the blondies out onto the wire rack. Invert the rack and cool the blondies the right side up. 12. Cut into pieces. These will keep for 3 days at room temp. when they are wrapped tightly. You can also freeze them for 2 months. Taken from the amazing "Baking from my home to Yours" by Dorie Greenspan pp 108-9.